A new version of the gene-editing tool CRISPR (clustered regularly interspaced short palindromic repeats) has been developed by a research team led by Feng Zhang, Ph.D., which says its ability to target and edit RNA presents several advantages over its familiar DNA-editing counterpart. Dr. Zhang, of the Broad Institute of MIT and Harvard, an original innovator of CRISPR/Cas9 technology, and colleagues, said this new CRISPR—which uses a version of the Cas13 enzyme—would enable transient edits that can be more easily reversed. That would thus allow the potential for temporal control over editing outcomes, as well as avoid the ethical issues that have arisen around DNA germline editing. The researchers closely characterized new subfamilies of Cas, uncovering an active version of Cas13, called Cas13b. They designed a version of Cas13b, and fused it with the ADAR protein, resulting in a platform they called RNA Editing for Programmable A to I Replacement (REPAIR). 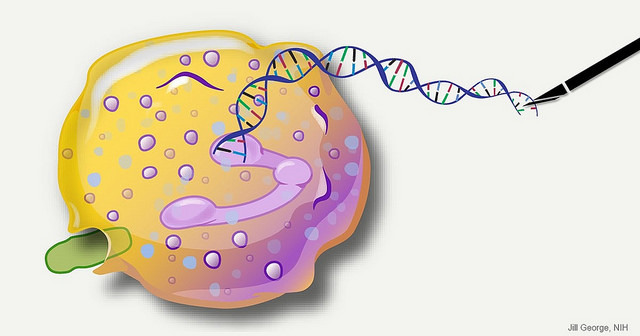 “REPAIR presents a promising RNA editing platform with broad applicability for research, therapeutics, and biotechnology,” the researchers wrote in “RNA editing with CRISPR-Cas13,” published today in the journal Science. “The temporary nature of REPAIR-mediated edits will likely be useful for treating diseases caused by temporary changes in cell state, such as local inflammation, and could also be used to treat disease by modifying the function of proteins involved in disease-related signal transduction. “REPAIR provides a new approach for treating genetic disease or mimicking protective alleles, and establishes RNA editing as a useful tool for modifying genetic function,” Dr. Zhang and colleagues concluded. The discovery of CRISPR/Cas13 “points out that there are likely many more molecules in the CRISPR kingdom that should be evaluated for their natural capability as superior tools for editing—in this case, RNA,” said Stanley Qi, Ph.D., of Stanford University. Dr. Qi developed the dCas9 technology for non-editing genome engineering, including CRISPR interference (CRISPRi) for sequence-specific transcription regulation and dCas9 for genome imaging in living cells. He is an assistant professor in Department of Bioengineering, Department of Chemical & Systems Biology, a faculty member of the interdisciplinary research institute Stanford ChEM-H (Chemistry, Engineering & Medicine for Human Health), and an editorial board member of The CRISPR Journal, an international, multidisciplinary peer-reviewed journal to be launched in 2018 by GEN publisher Mary Ann Liebert Inc.
“Undoubtedly, the new discoveries provide useful and powerful tools for RNA editing, when fused with ADAR enzymes. But it also inspires further questions such as what are the structural and biochemical features that makes one Cas13 better than another? Ultimately, the ability to design synthetic molecules as Cas9 or Cas13 should be the dreams of bioengineers,” Dr. Qi added. Another potential application of REPAIR would be to transiently or even chronically change the sequence of expressed, risk-modifying G to A variants, in order to lower a patient’s risk of entering a disease state. “For instance, REPAIR could be used to functionally mimic A to G alleles of IFIH1 that protect against autoimmune disorders such as type I diabetes, immunoglobulin A deficiency, psoriasis, and systemic lupus erythematosus,” the investigators added. Dr. Zhang and colleagues assayed a subset of the family of Cas13 enzymes for RNA knockdown activity in mammalian cells, identifying the Cas13b ortholog from Prevotella sp. P5-125 (PspCas13b) as the most efficient and specific for mammalian cell applications. Cas13b possesses pre-CRISPR RNA (crRNA) processing activity, allowing for multiplex editing of multiple variants. Any one of these alone may not affect disease, but together might have additive effects and disease-modifying potential, the researchers said. “Extension of our rational design approach, such as combining promising mutations and directed evolution, could further increase the specificity and efficiency of the system, while unbiased screening approaches could identify additional residues for improving REPAIR activity and specificity,” the investigators added. To demonstrate the first version of REPAIR (REPAIRv1), the researchers tested the platform’s ability to correct two disease mutations: 878G>A (AVPR2 W293X) in X-linked Nephrogenic diabetes insipidus and 1517G>A (FANCC W506X) in Fanconi anemia—achieving 35% correction of AVPR2 and 23% correction of FANCC. Next, the researchers tested the ability of REPAIRv1 to correct 34 different disease-relevant G>A mutations, and were able to achieve significant editing at 33 sites with up to 28% editing efficiency. An engineered variation of REPAIR (REPAIRv2) was used by the investigators to modify full-length stretches of RNA sequences containing known mutations. REPAIRv2 showed a greater than 919-fold increase in specificity. “The efficiency and specificity all seem promising as therapeutic tools but these need to be further evaluated in more cell types for efficiency and specificity,” Dr. Qi said. “The expanded toolkits for RNA editing is opening up doors to study RNA biology and understand their significance in various diseases. It may also become common tools for treating disease on a different layer in addition to DNA editing.